Stay calm. Your sound is now too. From the wall to the floor: with the STOIC base ideal sound is lifted up also from floors and furniture to enthusiastic levels. Constructional and in its design the STOIC base is a derivative of the STOIC wall mount. Its mandate: to eliminate vibrations from the devices' support. No matter if HiFi components are to be placed on the floor or on furniture such as side-boards. The metal framework of the STOIC base is made out of the same thick-walled steel tubing as the STOIC wall mount, the corners stiffened with triangle consoles. Hereupon, the hard unsprung coupling of the low-resonnance support plate made out of natural slate or birch plywood is put into effect. 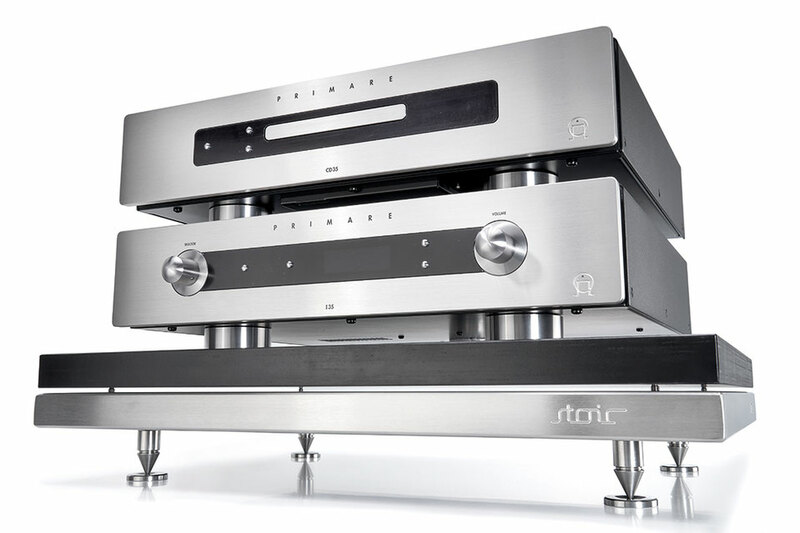 By its stability and rigidity, the STOIC base offers a solid place to very heavy power amps as well as sensitive components such as tube amps and turntables. Vibrating energy of what source ever is eliminated by the enormous mass of the construction: the frame is sand filled; additionally we recommend to choose the optional sand-filled support plate if you have to deal with especially bumpy or light underground. So there is no chance left for resonnances, motor vibrations, generator buzz or music energy flowing back via the floor. The STOIC base has a pay load of up to 100 kilogram. It is available in the standard sizes of 40 × 55 and 50 × 55 cm. On the design you have the choice of different materials and finishes – we want to fit the STOIC perfectly into your home. One thing staying the same with each STOIC is its elegant and floating style. At last, premium components require a high quality fundament.